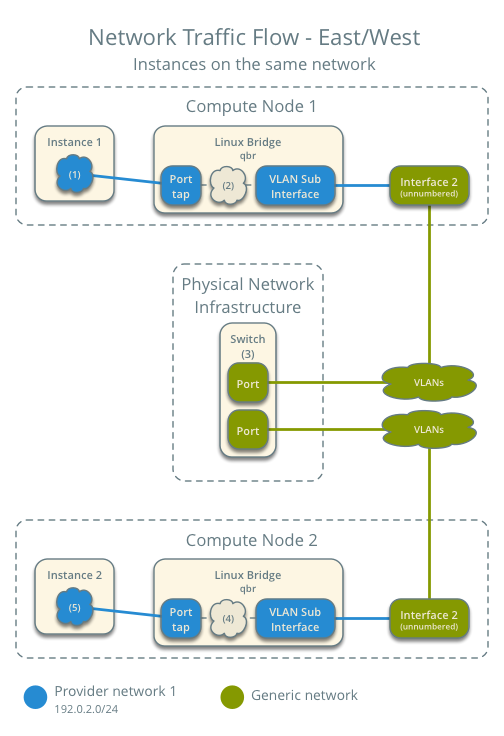 This scenario describes a provider networks implementation of the OpenStack Networking service using the ML2 plug-in with Linux bridge. 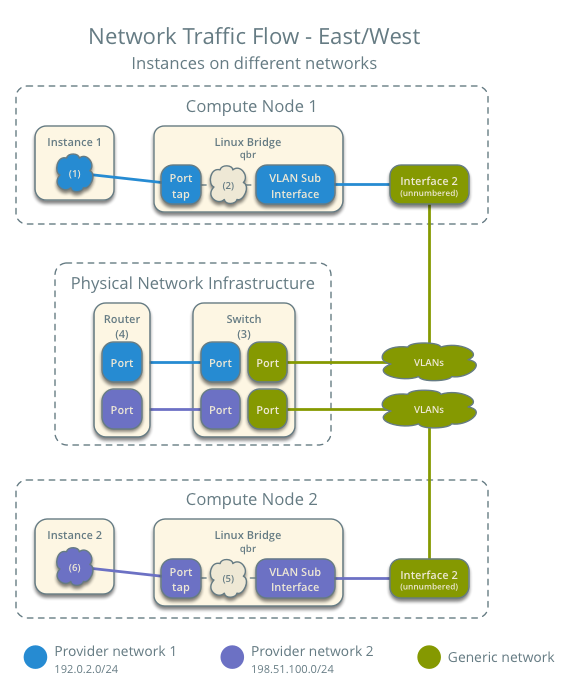 In many cases, operators who are already familiar with virtual networking architectures that rely on physical network infrastructure for layer-2, layer-3, or other services can seamlessly deploy the OpenStack Networking service. In particular, this scenario appeals to operators looking to migrate from the Compute networking service (nova-net) to the OpenStack Networking service. Over time, operators can build on this minimal deployment to enable more cloud networking features. Before OpenStack Networking introduced Distributed Virtual Routers (DVR), all network traffic traversed one or more dedicated network nodes which limited performance and reliability. Physical network infrastructures typically offer better performance and reliability than general-purpose hosts that handle various network operations in software. In comparison to provider networks with Open vSwitch (OVS), this scenario relies completely on native Linux networking services which makes it the simplest of all scenarios in this guide. 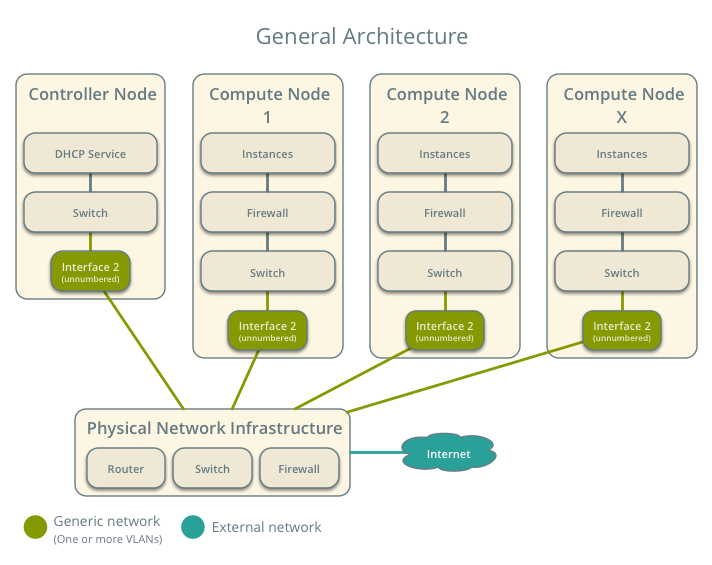 These prerequisites define the minimum physical infrastructure and OpenStack service dependencies that you need to deploy this scenario. For example, the Networking service immediately depends on the Identity service, and the Compute service immediately depends on the Networking service. These dependencies lack services such as the Image service because the Networking service does not immediately depend on it. However, the Compute service depends on the Image service to launch an instance. The example configuration in this scenario assumes basic configuration knowledge of Networking service components. 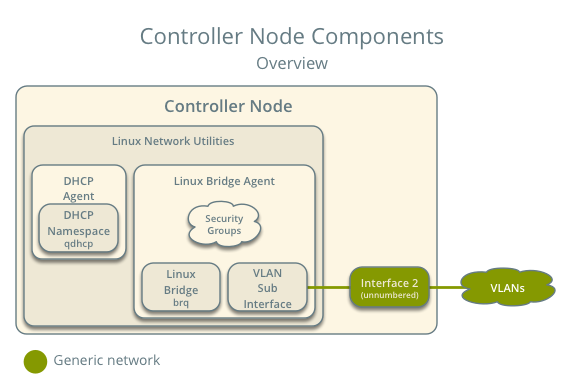 One controller node with two network interfaces: management and provider. The provider interface connects to a generic network that physical network infrastructure switches/routes to external networks (typically the Internet). 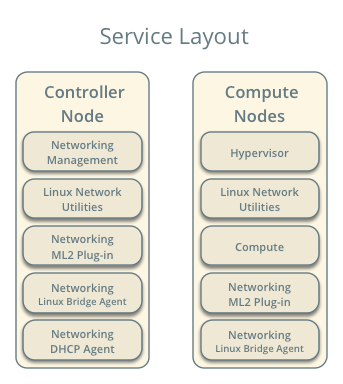 At least two compute nodes with two network interfaces: management and provider. 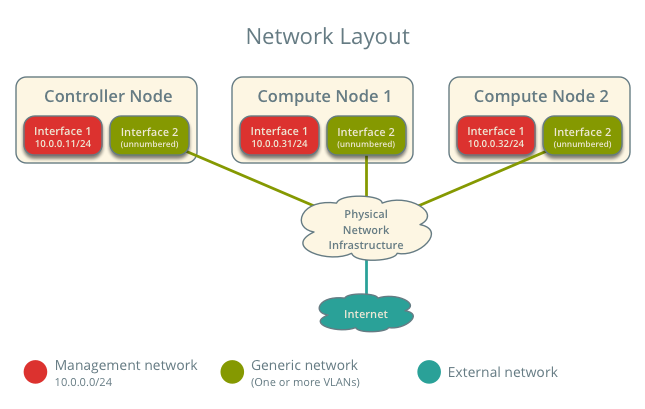 The provider interface connects to a generic network that physical network infrastructure switches/routes to external networks (typically the Internet). Neutron server service, ML2 plug-in, Linux bridge agent, DHCP agent, and any dependencies. ML2 plug-in, Linux bridge agent, and any dependencies. The instance 1 tap interface (1) forwards the packet to the provider bridge qbr. The packet contains destination MAC address TG because the destination resides on another network. Security group rules (2) on the provider bridge qbr handle firewalling and tracking for the packet. 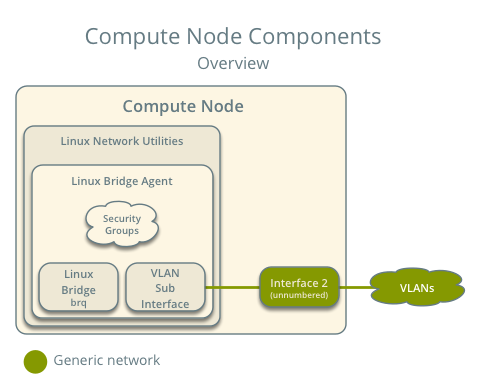 The provider bridge qbr forwards the packet to the logical VLAN interface device.sid where device references the underlying physical provider interface and sid contains the provider network segmentation ID. 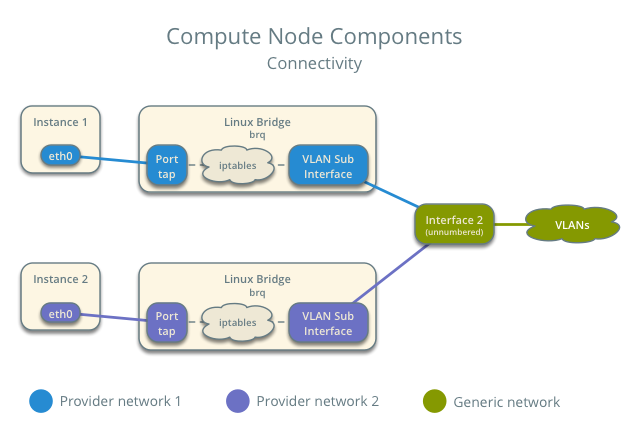 The logical VLAN interface device.sid forwards the packet to the physical network via the physical provider interface. A switch (3) handles any VLAN tag operations between the provider network and the router (4). A router (4) routes the packet from the provider network to the external network. The instance 1 tap interface forwards the packet to the provider bridge qbr. The packet contains destination MAC address TG1 because the destination resides on another network. Security group rules on the provider bridge qbr handle firewalling and state tracking for the packet. 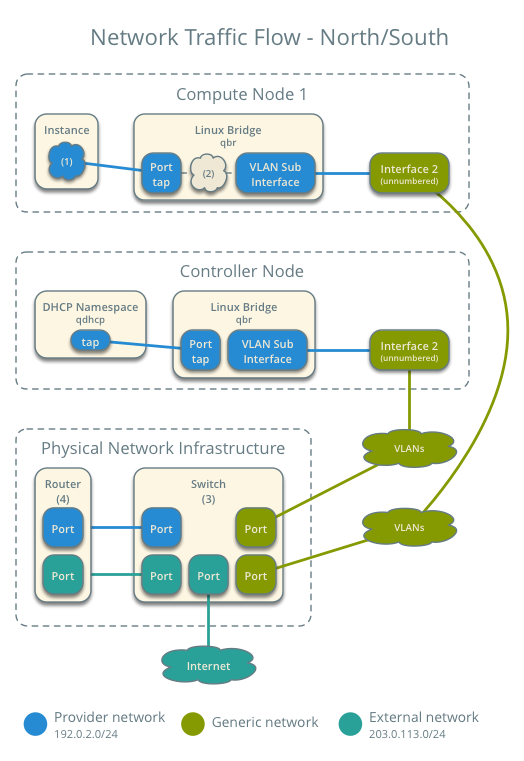 The logical VLAN interface device.sid forwards the packet to the physical network infrastructure via the physical provider interface. 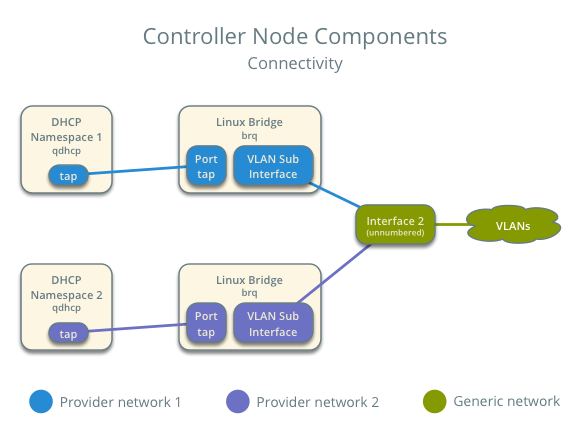 The physical provider interface forwards the packet to the logical VLAN interface device.sid where device references the underlying physical provider interface and sid contains the provider network segmentation ID. The logical VLAN interface device.sid forwards the packet to the provider bridge qbr. Security group rules (5) on the provider bridge qbr handle firewalling and state tracking for the packet. The provider bridge qbr forwards the packet to the tap interface (6) on instance 2. The instance 1 tap interface (1) forwards the packet to the provider bridge qbr. The packet contains destination MAC address I2 because the destination resides on the same network. Security group rules (2) on the provider bridge qbr handle firewalling and state tracking for the packet. Security group rules (4) on the provider bridge qbr handle firewalling and state tracking for the packet. The provider bridge qbr forwards the packet to the instance 2 tap interface (5).